Villahermosa is not the beautiful city its name suggests. After driving through its bustling but uninteresting downtown, we decided to try out an ‘auto-hotel.’ We noticed these attractive, gated 'auto-hotels' outside many cities on our drive through Mexico. We drove into Hotel Villa Magna on the edge of town. We were pleased by the price, the spacious room, and the fact that we had our own garage with an electronic garage door. We found it strange that we were not given a key to our room, which was located above our personal garage. The room and car were only locked when we closed the garage door behind us. We also found the room a bit unusual with a full length mirror behind the bed framed by flashing green LEDs, and lighting that was so dim we couldn't even read our books. I think we were memorable guests, since we ended up eating in the employee cafeteria (by accident). Since there was a menu in the room for the restaurant, we went down to the front desk to ask where the restaurant was located. I don’t know if we were having an off day in terms of our Spanish comprehension, if the employees had extremely strong accents, or if they were messing with us, but we simply could not understand how to get to the restaurant. Finally, one of the maids beckoned for us to follow her up a strange staircase through some back halls to the ‘restaurant’. This turned out to be the kitchen with a couple of tables for employees during their breaks (we think). I don’t know if the cooks or we were more confused, but we were fed so we were happy. Several weeks later we were discussing this experience with Kelsey and Tom, travelers who are also driving to South America. We came to understand that these 'auto-hotels' are the Mexican equivalent of a Japanese 'love hotel.' These hotels exist solely to give people a discreet place to stay with the emphasis on privacy. Just like Japan, many Mexican people live with extended families in smaller houses, making a romantic night with your new wife difficult if share a room with your cousins. I think that explains why I kept on hearing ocho horas (eight hours) when the maid was quoting us prices during one of our confusing conversations. We stayed for 12 or 14 hours though - I don't think they thought it was worth trying to explain their hotel concept to the clueless foreigners. ...you never know what you're going to get. It is not at all similar to driving on US highways, where you can turn up the music and operate on autopilot. In Mexico you constantly need to be on guard. Most highways are smaller two lane roads lacking shoulders, marred by Volkswagon Beetle-sized potholes, herds of animals accompanied by cowboys on horseback cross freeways at will, adults and children bike or walk along the freeways, and freeways end unexpectedly. Maps are outdated: a paved highway we recently took was shown as a dirt/gravel road on the AAA map. Our friend's map was even worse: it showed the road as incomplete with a 300 mile gap between the two gravel sections. These are not hand me down maps, they were recent purchases. Adding to this confusion, the signs themselves on the highways are often contradictory. While the highways themselves are numbered, we have found it much more useful to ignore these numbers and pay attention to the endpoint city as indicated on the signs. It wasn't unusual to have signs pointing in three or four different directions, each indicating a different city, but each also marked with the same freeway number. The distance to cities also seemed to be a rough guess in many instances as well. 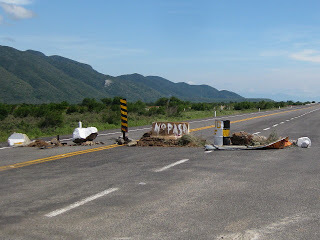 For example, when driving from Oaxaca to Puerto Escondido, we expected that the distance to Puerto Escondido should decrease in a regular fashion as we approached the city. However, after passing a sign indicating Puerto Escondido was 300 km away, ten minutes later the sign indicated that it was in fact 315 km away. This was not an isolated incident. The time to drive between two distant locations is seemingly always vastly underestimated when asking directions from otherwise very helpful and friendly locals. I think maybe they want you to get there quickly, so give an overoptimistic estimate. And as road conditions can vary so widely, knowing the km distance between two cities isn’t helpful for estimating the time it can take to travel this distance. Our guidebooks provide bus schedules between cities, which we have also tried to use to estimate our driving times, but the bus drivers must be more willing to risk the lives of their passengers as the buses always seem to beat us by a couple of hours. All of these variables came into play when we left Puerto Escondido. Our plan was to drive east to Tuxtla Gutierrez, the capital of Chiapas, north through the city of Villahermosa, then east on to Palenque. This would bring us from the Pacific Ocean across the narrow isthmus of Mexico to the Gulf of Mexico. After spending the night in Tuxtla, we were told it would take about 3 hours to get to Villahermosa, and another hour to Palenque from there. Our guidebooks pointed us to a new freeway (slated for completion in 2006) to Villahermosa. The freeway still had large unpaved sections (with unmarked lanes) as construction wasn't complete. The ‘shortcut’ we then took from this highway to Villahermosa immediately turned into a rutted-out, slightly flooded windy country road, but did improve after a couple of hours. About 6 hours later (double the estimated time) we arrived in Villahermosa and decided to spend the night there, as it was getting late. After spending a week in Oaxaca City and hiking the surrounding Sierra Norte Mountains, we were ready to leave cool weather behind us and head back to the warm beaches of the Pacific coast. Mexican Highway 175 took us out of the cactus strewn mountain highlands and into the green humid tropics of the Oaxacan coast. Changing into shorts and sandals in the hot afternoon sun, Kristin and I laughed about how only 24 hours earlier we sat in a rain soaked town at 10,433 feet, wondering when we would ever feel warm again. After spending a night in San Augustinillo in air conditioned comfort, we drove up the coast to the former fishing town of Puerto Escondido. After looking through our guide books, Puerto Escondido seemed to have everything we were looking for - nice beaches, surfing, and a laid back traveler's scene. As we reached the outskirts of town, the two lane highway was in the process of being rebuilt. The thick cloud of dust kicked up by pickup trucks and taxis and the drab buildings next to the road started to lower our dreams of entering a beautiful tropical beach town. Before giving up on the place, we decided to check out Playa Carrizalillo, one of the beaches in town. Our hopes dimmed as we parked at the end of a dingy gravel road and walked through a trash filled park. Things changed around quickly as we reached the edge of a cliff. We were looking over a beautiful palm lined emerald bay with a white sand beach. A dozen surfers lined the left side of the water, while snorkelers explored the coral reefs on the right. As we stood sweating in the blazing sun, I imagined myself laying on the beach sipping an ice cold Pacifico beer, struggling with tough decision of whether I should choose surfing or snorkeling as my next activity. Things only got better after finding a simple yet affordable room at Beach Hotel Ines, complete with a thatched roof restaurant overlooking the pool. This was a luxury we usually could not afford. Our hotel was located on Zicatela beach, a world renowned surf spot. The next morning I wanted to check out the waves, so I walked out of the hotel and over to the beach. The road separating the beach from the hotel was in the process of being redone, and a 10 foot ditch was being dug by means of a backhoe and a half a dozen construction workers. None of the men wore helmets, and had either bare feet or flip flops for footwear. Once on the beach, I watched surfers expertly ride waves breaking 6 feet or more over their heads. Not only did the wave have height, but extreme power. The wave would quickly rise up, curl into perfect barrels, then slam viciously into shallow water. The wave would collapse at such speed, only a few surfers could escape getting crushed. Many of the surfers would gracefully ride the face of the wave and disappear into the blue green tube, only to reappear behind the whitewater after a brutal beating. I could see why Zicatela is nicknamed “the Mexican Pipeline” due to its similarity to the huge break of that name in Hawaii. Our hotel was filled with an international group of surfers, all toting Guns. Guns are long pointed boards used specifically for surfing big waves. The book “The World Stormrider Guide” gives the following advice for the Oaxacan coast: “Bring a couple of boards, including a gun and be prepared to snap them. A helmet is a good idea”. In the course of a week, we saw three broken boards being brought back to the hotel. The LA Times ran an article where they interviewed Godofredo Vasquez, one of the beach lifeguards. “I’ve seen people paralyzed, get broken noses, eye injuries, shoulders dislocated.” Vasquez said. “These waves are very strong.” Kristin pointed out that even the boogie boarders surfing this beach are in excellent physical shape. These boogie boarders were not the common overweight kids or middle aged man on vacation you see on other beaches. These guys are riding huge waves and often finish their ride with an “El Rollo.” El Rollo is a trick were they hit the lip of the wave, and then do a roll before landing back on the water, much like an airplane does a barrel roll. I did try to surf the break later in the week when the waves were much smaller, but the only real success I had was putting two cracks in my board. Kristin managed to stand up for the first time on a couple of waves at the much tamer Playa Carrizalillo. Since she's now officially a surfer I think she should buy a rash guard – something she resisted earlier stating that she wasn't deserving. Overall, we spent a very pleasant six days lying by the pool, surfing, reading, and catching up on some Spanish lessons. For some reason after six days of this we decided to leave; I think we may have been a little concerned that if we didn’t leave soon, we might spend the next 2 months here (click here for YouTube video of our experience). Our next destination is the state of Chiapas, where we will be exploring ruins in the northern jungles, and celebrating Dia de Muertos (Day of the Dead) in San Cristobal de la Casas. Oaxaca is a beautiful smaller city, with many colonial buildings housing artists’ galleries, museums, and delicious restaurants (as well as the omnipresent stone churches and a shaded zocalo). At this point in our trip, we’ve perfected the art of wandering through cities, window shopping, and soaking up the culture. We also spent a day exploring the ancient ruins of Monte Alban, the ancient capital of the Zapotecs. It is situated high on a hill with 360 degree views of the surrounding Oaxacan valley, and was occupied from 500 BCE to 700 ACE. Some of Oaxaca’s culinary specialties include: creamy hot chocolate, made with cocoa, vanilla, cinnamon, and almonds; tlayudas, which are large crispy tortillas filled with beans, avocado, and meat; and fried grasshoppers. Chris tried the first two, but declined an offer to sample the fried grasshoppers by a woman selling them out of a large basket in the main market. By mistake, I may have had the most unique meal. I think I ate liver by accident when I didn’t understand the waiter’s description of my order. We also decided to look around at the various items for sale in the town. Oaxaca is known for its handicrafts, so when we saw a street vendor selling wool rugs with beautiful designs, we stopped to take a look. After admiring a few designs, Constitine, the vendor, started talking prices. We told him we would stop by later after looking around. We did find other rugs at lower prices in other stores, but still liked his designs the best. As we walked out of one of the artisan cooperatives in town, we found our new friend Constitine waiting for us. He wanted to know if we were ready to come back and look at his rugs again. We walked back with him and agreed to a much lower price. I liked the rug much more after looking at his card, seeing that his shop is located in the famous weaving village of Teotitlan del Valle. This village has been producing cloth for hundreds of years - Teotitlan used to give Aztecs cloth as tribute. His story about creating high quality products using traditional natural dyes seems to be valid. His card says you can stop by his workshop at any time to see how his rugs are produced. We are planning to head that way, so we may take him up on the offer. After several days in Oaxaca, we headed for the hills of the Sierra Norte. Many of the small Zapotec villages in this mountainous area have formed a community, Los Pueblos Mancomunados, where tourists can hike, mountain bike, or horsebackride between the different villages. The villages have built very nice cabanas with fireplaces and nearby comidas, which serve delicious food to fill the stomach after a long day hiking. We were a little over-enthusiastic when we planned our trek, however, and limped into each successive village after too many miles with too much elevation change each day. We first hiked from Cuajimoloyas to Lachatao, and while the 17 mile hike itself wasn’t that interesting, we ended our hike in a beautiful valley spotted with small villages. We were pleased that our cabana was located across the cobblestone street from the 17th century church at the center of the town. We were surprised, however, to find the peacefulness of the small pueblo broken every couple of hours by an announcement made from large loudspeakers on top of the old church. Our Spanish is still not good enough to understand the fuzzy echoing speech. 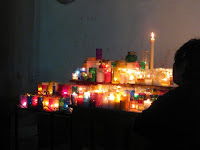 The speakers also served as an alarm clock around sunrise the next morning by blasting marching band music, followed by the ringing of the church bell for several minutes. During breakfast the friendly town doctor explained the announcements to us; the town has only one phone, so incoming calls are announced, and the receiver of the phone call has 10 to 15 minutes to get to the phone to accept the call. We forgot to ask why the marching band music was blasted through the town, so I guess it will remain a mystery. Another punishing hike through the mountains the second day was made slightly more humiliating by the fact that our guides were all grandparents who had been hiking the hills their whole lives. This hike was much prettier than the earlier day, as it followed a rushing river as it wound up the mountains through trees draped with moss. This is the first time we have seen a forest of trees that have bunches of agave plants and cactus growing in them, along with a few trees that had thin, long tubular cactus draped across their branches. Our very knowledgeable guide, Javier, enthusiastically explained many of the plants and animals to us in Spanish and I think we managed to understand a third to a half of what he said. He showed us horsetail, which is used to cure an upset stomach, fields planted in the traditional fashion with corn and beans growing symbiotically, and berries that when crushed create a bright red juice which is used for dying cloth. He also would give us names for plants and animals in both Spanish and Zapotec. Javier has been a guide for eight years, and the reason for his strong knowledge about the area is that his parents took him into the forest ever since he was a little boy, teaching him about the plants and animals. We stumbled in to Latuvi later in the afternoon, where we enjoyed another meal in the local comida before building a fire in our cabana to keep ourselves warm while we tried to stay awake until the sun set. The next morning our plans changed slightly as I was unwittingly given a peanut-laden cookie with my hot chocolate (of which I only ate a very small amount). Since I am very allergic to nuts, it was relieving to both of us that the reaction was very mild. We decided however to cancel the day’s hike. I was hesitant about embarking on a 6 or 7 hour hike up 4,000 feet. Every cloud has a silver lining though; Chris and I had been dreading this last leg of the route, given how sore and tired we were from the previous two days’ hikes, so we welcomed the excuse to take a cab to return to our car in Cuajimolayas. 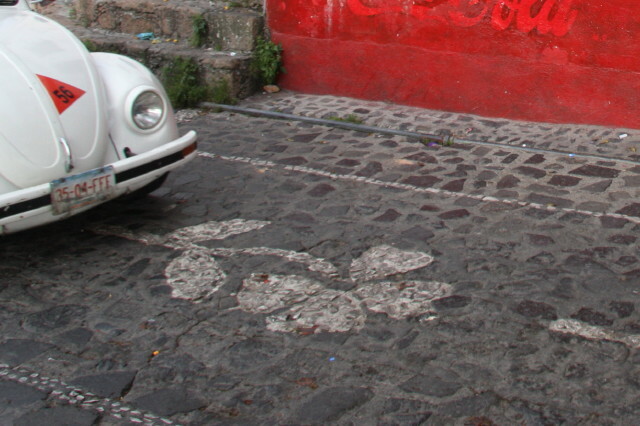 We were instantly charmed by the narrow, winding, crooked cobblestone streets of Taxco. Less charming was driving our car up these streets to the parking lot, but after several tense minutes and a couple of near misses with the aggressive cabs, we got rid of the car and spent the next days wandering by foot. We stayed in the beautiful Hotel Emilia Castillo, near the zocalo, or central market. The hotel rooms are decorated with traditional Mexican furnishings, and the and interior courtyard lobby and bar contain unique ceramic bowls and dishes inlaid with silver designed by the Castillo family. Most of these exquisite bowls are sold to Nieman Marcus, but you can also purchase them at the silver store in the lobby. We spent many evening hours in this lobby, playing chess, reading, and getting to know the very friendly Castillos. Like other cities we have visited in Mexico, Taxco was a silver mining town exploited by the Spanish from the 1500s to the late 1700s. The city went into decline when the mines were largely depleted, but was rejeuvinated through the development of silver workshops to use the amounts of silver remaining. Within a few block radius of the zocolo, almost every store was a silver shop, restaurant, or hotel. The cobblestone streets of Taxco were especially interesting as designs, often representing the name of the street, were included as white stones in the street itself. We spent most of the days wandering the streets, browsing in the silver shops, and enjoying our meals on balconies overlooking the many squares and churches of Taxco. Luckily for us, Werner from Restaurante Tropicana gave us very good advice concerning getting stopped by the police. We have been on the road for a month now, and we have not had a single incident with the police so far. Our luck changed as we drove out of a Pemex gas station and onto the main highway out of Acapulco heading for Taxco. A police car pulled us over, and Kristin handed him her license (big mistake), as she was told to do. The officer said we drove through a red light when we pulled out of the gas station. He pulled out his pad and pen, and told us we could get the license back when we paid the fine at the police station after 4 pm. He showed us the fine amount, printed on the back of the ticket: $160. And in broken English explained repeatedly that the ticket, the license, and the photographs from the traffic camera proving our red light infringement would all be available after 4 pm at the police station. I thought we were screwed. I was looking through our guide as we drove, so I thought we did accidentally drive through a red light, and now we were going to have to pay for another expensive hotel room in Acapulco along with this huge fine. Werner and our guide books pointed out that most police officers that pull you over will try to get you to pay them money directly on the spot, which of course goes directly into their pocket. Werner also told us that every police car in Acapulco will have “Tourists pay no fines” written in Spanish on the trunk. However, this officer was slowly writing out a ticket, and telling us we would have to pay the ticket at the police station. However, Kristin knew she did nothing wrong and proceeded to follow Werner's advice. Werner told us that the only way to avoid paying bribes to the police was to stand your ground. Kristin strongly insisted that she did not run a red light, and demanded her license back. The officer insisted she did, and kept saying the pictures will show this proof when she went to the station. After this went on for a minute or so, the officer came to a solution to our problem - we could pay him on the spot! At this point, Kristin knew he was trying to bribe us, and firmly (if not a little loudly) stated, “We are not paying you, give me my license back NOW. We are leaving.” I thought for a moment that we may have to drive off without Kristin's license. Kristin's demand ended up working just like Werner told us it would. After telling us to pay him directly a few more times and seeing us not change our stance, he apologized for his poor English, handed back her license, shook both of our hands with a big grin on his face. We realized later that we had fallen into the perfect trap - an out of country vehicle driving out of town! No more than 5 minutes later, we had another cop pull us over, and tell Kristin she ran two red lights. This time we were prepared, and handed him a photocopy of Kristin's passport. He started saying something to us in Spanish, we think he was telling us we must hand over our passports. Every time he said something, Kristin would just say no entiendo (I don't understand) over and over. He pulled out his cell, and said he was calling the chief of police. I think Kristin's sarcasm may have been lost on him when she snarled 'you do that.' We shrugged our shoulders, and looked around bored. After a few minutes he came back to the car, handed back the passport photocopy, and to ld us to slow down. We now really understand how this works. If you are at a border crossing or military checkpoint, you will be asked for your passport, and you can hand it over. Even though the military checkpoints are very intimidating with their automatic weapons and sandbag bunkers, we found every one of them to be very professional if not friendly, apologizing for searching the car. We do keep money or small valuables with us during the search just in case. The local police seems a different story; they will act tough, try to tell you about a traffic violation, and attempt to extract a bribe. Do not give them any documents, only photocopies. If they keep insisting on seeing originals, tell them you will drive your car (don't go in their car) to the police station and pull them out there. Don't show any fear and stand your ground. Kristin pointed out that she “would never speak that way to a police officer in the U.S”. Thanks again Werner, you really saved us on that one. Since you said you hate computers and never use them, we are going to send you a thank you postcard. It will have to be addressed to Werner, Restaurante Tropicana, Plazoleta La Quebrada, Acapulco; who knows if it will find you there. Hearing tales of crime, we followed the advice Bruce in Tracones gave us and booked an nice hotel in Acapulco. At least the price turned out not to be too painful, what we expected to cost $200 to $300 USD a night was only $70 USD. After parking our car at the Hyatt, admiring the large room and our choice of two pools, we took one of the many buses that run along La Costera, the road that hugs the long bayfront of Acapulco. After our warnings about Acapulco, we were pleasantly surprised to find a beautiful city climbing up steep green hills on a large bay. Acapulco city buses are unlike anything we have in the US; I think if we got creative with our public transportation in this fashion, more people in the US would think about getting rid of their cars. There is literally one of these buses every 20 or 30 feet, and cost only $0.45 USD a ride. Covered with airbrushed custom artwork , each bus was uniquely named in huge mirror letters covering most of the windshield. "Dark Night" and "Garfield" were equiped with booming sound systems, whereas the only sound "Seahorse" made was ear piercing squeaks whenever the brakes were applied. These buses may not be in mint condition, but they are an effective way to travel. Your next best bet at a much higher price are the fearless Volkswagen beetle cabs darting around the city, but make sure to negotiate the fare before stepping in. We took the "Seahorse" bus over to the market, and walked up a steep hill to watch the cliff diving show at the Quebrada. These fearless young men jump into a narrow bay surrounded by steep jagged rocks, with fairly rough surf tossing them around in the water. They then climb up a steep cliff (unaided by ropes or any protection) and dive off small platforms. We stopped to eat after watching the cliff divers perform. Restaurante Tropicana was empty except for a lone man sitting at a table up front. We sat down next to him, and found out his name was Werner. Werner opened up the restaurant around 2 years ago, personally tiling the floors and creating the furniture. Coming over from Germany over 20 years ago, his career varied widely from metal recycling to a shady importing business. Ordering off a special menu, our excellent German meal ended up going from an one hour event to many beers (on the house) and discussion until early in the morning about everything from economics to politics. Werner's girlfriend's phone calls inquiring his whereabouts became more frequent as the night went on, and he finally caved in to the pressure around 1am. If you ever end up in Acapulco watching the Quebrada cliff divers, to yourself a favor and walk across the square to enjoy a great German meal.